Uber Technologies Inc. SUV had crossed at least one open lane of road before being hit, according to a video of the crash that raises new questions about autonomous-vehicle technology. NTSB investigators in Tempe, Arizona, examine the Uber vehicle involved in Sunday’s fatal accident. Herzberg’s death is the first major test of a nascent autonomous vehicle industry that has presented the technology as safer than humans who often get distracted while driving. For human driving in the U.S., there’s roughly one death every 86 million miles, while autonomous vehicles have driven no more than 15 to 20 million miles in the country so far, according to Morgan Stanley analysts. Zachary Moore, a senior forensic engineer at Wexco International Corp. who has reconstructed vehicle accidents and other incidents for more than a decade, analyzed the video footage and concluded that a typical driver on a dry asphalt road would have perceived, reacted, and activated their brakes in time to stop about eight feet short of Herzberg. Other experts questioned the technology. The Uber SUV’s “lidar and radar absolutely should have detected her and classified her as something other than a stationary object,” Bryant Walker Smith, a University of South Carolina law professor who studies self-driving cars, wrote in an email. The video shows the vehicle driving for about four seconds before ending just as Herzberg is about to be hit by the SUV’s front, right bumper. The woman can be seen taking several steps while visible and appeared to be moving at a normal walking pace as she’s crossing the road outside of a crosswalk and does not look up at the SUV. Police have said the car didn’t slow or swerve to avoid the impact. She later died at a hospital. 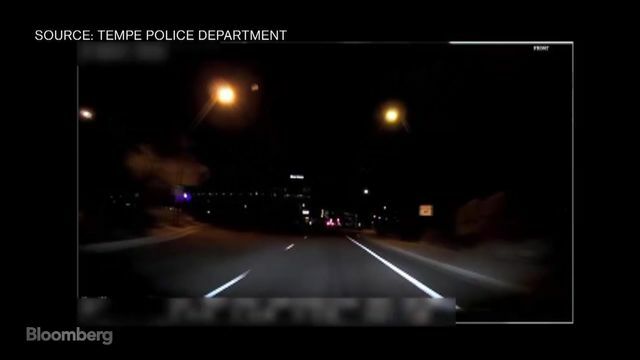 Police have released video of the fatal Uber driverless car crash in Tempe, Arizona. Uber’s self-driving system includes radar, cameras and lidar, which uses lasers to detect objects. The system is designed to provide a 360-degree virtual view of the environment surrounding the car. Ramsey said it is “mystifying” why the vehicle didn’t react given that lidar systems like the one used on Uber’s SUV have a detection range of at least 100 meters and work better at night than during the daytime. “The video is disturbing and heartbreaking to watch, and our thoughts continue to be with Elaine’s loved ones,” Uber said in an emailed statement after the video’s release. “Our cars remain grounded, and we’re assisting local, state and federal authorities in any way we can.” The company is cooperating with the investigations. It declined to comment further on Thursday. Herzberg becomes visible in the car’s headlights as she pushes a bicycle across the road at least two seconds before the impact. “This is similar to the average reaction time for a driver. That means that, if the video correctly reflects visible conditions, an alert driver may have at least attempted to swerve or brake,” Smith said. The comments contrast with those made by the Tempe police chief, who told multiple media outlets that the pedestrian moved suddenly in front of the car and the crash didn’t seem preventable after reviewing footage of the collision. Moore, the forensic engineer at Wexco, said dashcam videos tend to understate what humans drivers can see. While the pedestrian appears from the shadows in the video, a human driver may have had a better view if they’d been watching, he said. Sean Alexander, of Crash Analysis & Reconstruction LLC, concurred. “Video makes everything in the light pattern brighter and everything out of the beam darker. A human eye sees it much clearer,” he said. Alexander also agreed with Moore’s analysis that a human driver could have avoided hitting Herzberg. “During the time the vehicle should have been braking, the pedestrian would have had additional time and would have cleared without the vehicle actually having to stop,” Alexander said. Tempe police released a statement Tuesday saying that “fault has not been determined in this case” and that a decision on criminal charges would be left to county prosecutors once the investigation is complete. The video also included footage of the Uber backup driver who monitors the vehicle’s operation from behind the wheel while the computers drive. Out of approximately 13 seconds of that recording, the driver was looking down and away from the road for about 10 seconds. The driver looked up about a second before the recording ends and gasped upon seeing the impending collision. While it’s too early to say why the car hit the woman, the video doesn’t show the crash was unavoidable, said Ryan Calo, a law professor at the University of Washington who specializes in robotics and artificial intelligence. “The idea that the video absolves Uber is essentially incorrect,” Calo said. The important question for investigators won’t be whether the woman was visible in the low-definition video, he said. It will be what the car’s sophisticated sensors picked up and how the software interpreted that data. “Even if the cameras did not perceive her in time, why didn’t the lidar see her and why didn’t the software predict that she would continue on the path she was on?” Calo said. National Transportation Safety Board and will be examined as part of its probe. The safety board has increasingly used video in its investigations and has a lab in Washington where it examines various recording devices to tease out useful forensic data. It’s important not to read too much into the video without additional context on how the self-driving system was functioning and the conditions on the road, said Deborah Hersman, president of the National Safety Council. Uber said on Monday that it was pausing tests of all its self-driving vehicles on public roads in Pittsburgh, San Francisco, Toronto and the greater Phoenix area. In Boston, self-driving startup NuTonomy Inc. halted its tests after city officials requested a pause following the Arizona crash.